The card has two outputs PWM current feedback to control a proportional valve, a safety relay output to stop the movements, two digital output signal basket inclination, when exceeds 6°. 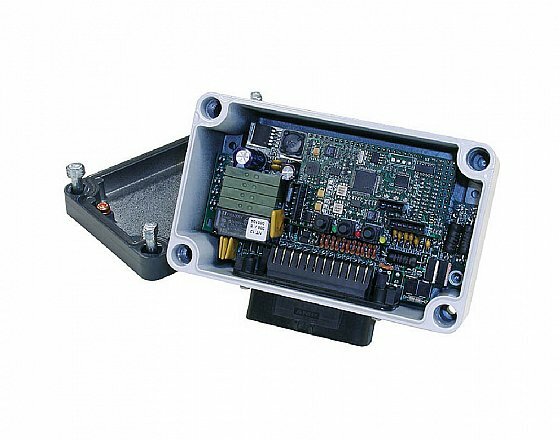 The optimisation of working parameters can be easily done via serial connection and user interface software BPE_Terminal. Using BPE terminal can make the alignment of the zero level of the LAB3 with the zero tilt basket, set the minimum current to the proportional levelling valve, the current gain, change the operating angle of the two current outputs for the alert of 6° exeeciding basket tilt, and finally adjust the width of the dead zone in correspondence of the zero grade requirements.